Everyone who knows me well will know that I have a thing for mug, therefore it would come no surprise when I came across these beauties by Feldspar, I was utterly obsessed. 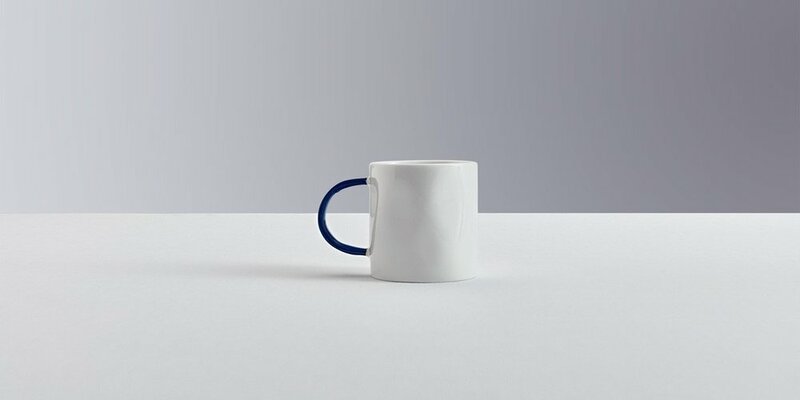 From their minimalistic branding to the English country coziness their product conveyed, a set of their mug and candle is all you need for this winter. I also particularly like how the fine bone china container is purposely glazed/designed to be translucent, allowing you watch as your tea flows in your mug and glows as the candle burns. Here more from our conversation with the amazing duo, Jeremy and Cath Brown. Every single details from the packaging paper, boxes to the mugs, you can tell how they pour their hearts in it - isn't this amazing? How did it all started - what was the catalyst that sparked your interest to start your own studio? We moved from Hackney to Dartmoor at the end of 2015, just after our son was born, and started just making things we needed and wanted. We were so overwhelmed by the amazing quiet and huge space we suddenly had at our disposal, and so we bought a pottery wheel and kiln and started experimenting. Our whole families (I’m one of four kids, Jeremy is one of six) were coming down for Christmas and we simply didn’t have enough plates and bowls, so that was step one - we still use them everyday! We experimented with different shapes and glazes, and just spent time understanding our raw materials really well. We decided that if we could we’d much rather stick to designing and making things from our home in middle of nowhere rather than spend our days travelling or in offices. It was something we’d always wanted to do - we both have design backgrounds, Jeremy trained as a furniture designer and went on to help set up a UN programme for ethical supply chains in luxury fashion, and I trained as an architect - it just wasn’t really something we thought we’d do so soon! We were anxious not to compromise at all - everything we make is made properly, by highly skilled craftspeople, here in the UK. Even the paper for our packaging is milled in the Lake District, and assembled into boxes in Malvern - we wanted to create beautiful, functional objects that are a pleasure to give or receive. What inspires you creatively? What's the process like for creating a new piece? What's a day-to-day like as an entrepreneur? It seems to be all about lots of different jobs, all at once. We do everything ourselves, from graphic design to branding to managing production and even the accounting, as well as looking after our son and our new puppy! We launched just before Christmas last year, so are very much learning as we go along, but day-to-day we work from our home and studio in Devon, which is at the end of a long lane, with no neighbours and views over Dartmoor. It’s great, we have pretty patchy internet and no phone signal but we manage to do everything from here. We always like to meet the people we’re working with if we can - the craftspeople and manufacturers who make Feldspar possible - so we do travel around the UK quite a bit but generally you’ll find us at home, having a coffee under the giant oak tree outside our kitchen in between packing orders up, making prototypes, organising production etc. We’ve also been digging up some clay from our garden to make some one-off pieces with, which we’re really excited as the making is what we really enjoy. The clay is a beautiful sandy orange colour and has been firing better than any shop bought clays we’ve tried so far… so watch this space! Stay tuned for our next newsletter, we might be giving away something special for your winter to come! But for now, head over here and check out their beautiful pieces.